Check out this adorable new robot toy from Fisher Price: Bright Beats Dance and Move BeatBo. 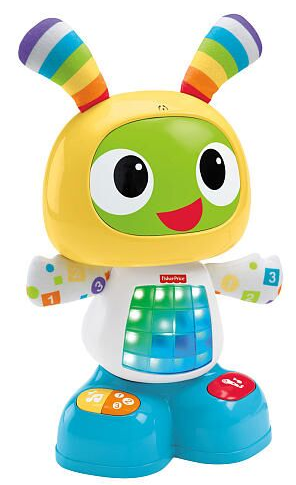 Fisher Price is always genius at incorporating learning into their toys and BeatBo is no exception. Keeping in mind how babies explore and learn through their five sense, BeatBo is designed to engage with them through sight, sound and touch. He sings, dances and plays learning games to help introduce little ones to letters, colours, counting, music, cause and effect, and more. He even has the ability to record a short phrase and then remix it into his favourite song. I can easily imagine the delight a toddler would have at a toy that, for example, sings their name, or says “I love you” in mommy’s voice. Pretty neat, eh? EDIT: This giveaway has ended. Congrats to Caroline M. & Robyn B., who each won a BeatBo of their own. My granddaughter turns 1yr next month, this is exactly what I want to buy her!